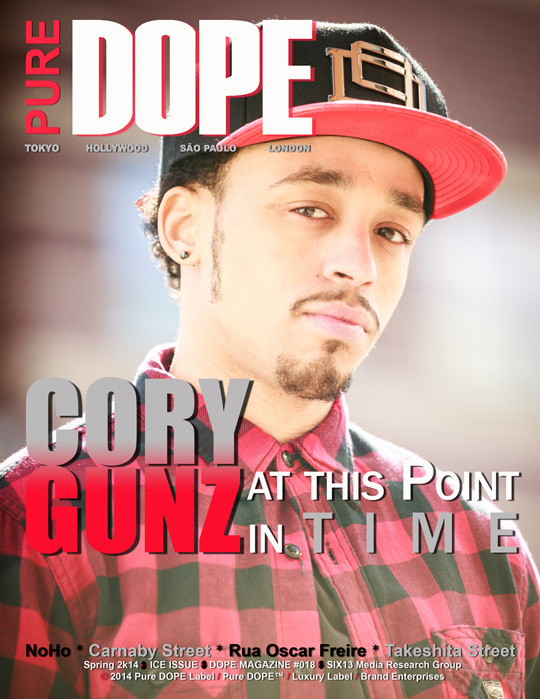 Cory Gunz covers the latest issue of Pure DOPE magazine, which you can view above. The Gunna also sat down with Brittany Smooch from the magazine for a one on one interview while in New York City last month. During the interview, Cory spoke on New York hip-hop, his next project that he is currently working on called Kriminal Minded, what he would be doing if he was not a rapper, items that he cannot leave the house without, his favorite fast food place, important qualities in a lady, musical influences, places he wants to visit, and more. You can watch an excerpt from Pure DOPE and Gunz‘ interview below, as well as read the full interview! There’s an ongoing discussion regarding New York Hip Hop as being back. With you, A$AP, French Montana, Joey Bada$$. What are your thoughts on that? I feel like it never left. Everybody gets their turn. Hip Hop is about growth and expression. The torch gets passed around every once in a blue moon. Everybody has their time. As long as its DOPE music and its hot, then it will go far. But as far as New York, I see it standing back up again. It’s rising back up to that platform. A lot of the artists you mentioned earlier, such as myself that’s from here born and raised, are trying to carry the torch and keep the sound popping. Really, my focus is just turning it up. Bringing an authentic sound. Because when you say ‘bring New York back, it’s almost like you’re trying to resurrect the sound of the past. The past is the past basically. You can’t bring that back. But New York has an authentic sound now. Anybody who is genuinely from here, or anybody from anywhere, can identify with it. I love it. So you came back hard with the “Datz WTF I’m Talkin’ ‘Bout” mixtape. But there’s this thinking that battle rappers and freestylers don’t make hit songs. But you do. So you’re changing that theory. Thank you. I appreciate that a lot. A lot of guys have that perception, like dudes who battle rap can’t make records. Or that some guys in the mainstream can’t come get in the battle ring, you know what I’m sayin’. But at the end of the day it’s all an art form. It’s up to you. It depends on what your versatility is. I grew up in a well-rounded Hip Hop household. I can battle. I can write songs. I can freestyle. I can do whatever I want. Was there a specific audience you were trying to reach with “Do Something” and “Get Touched”? Those are really just me coming from the chest. On a lot of my stuff now, I just come from the chest. I’m not targeting a specific group in particular. As far as where my music is concerned, I want everybody to turn up. Be on the same page with me. An artist like Tupac. An artist like Wayne. Artists like Eminem, Jay Z. They bring you into their world. Music is a mood changing thing. I just want to bring people into my world. What’s the next challenge for you musically? My album, honestly. I’m working on an EP right now called Kriminal Minded. And the follow up is definitely going to be the album. That has been the biggest challenge so far. Making that transition. Seeing how things work differently from a mixtape, to an EP, to an album. The industry ins-and-outs. You know because, I’m outside. I’m still learning. There is so much to learn in this business. I’m just happy to be one of the survivors. A lot of guys that came out when I did aren’t here anymore. I’m glad to be one of the last few standing. You were born into Hip Hop with your father also being in the industry. But what would you be doing if you weren’t in the recording industry? I’d probably be a historian. I like knowing my history, knowing how things came to be. I like reading. I think it would be something in that field. Lyrically, you are your only competition. From that standpoint, is something different about you now, in 2014, than say a few years ago? Back in 2010? Growth. Changes in life period. Adulthood. Situations, things I’ve been through both publicized and personal. But really just growth. I think people who have been following me since early on can hear the difference. Mainly just the Kriminal Minded EP. I was working on a mixtape called Timbs and Hoodies, just me jackin’ beats. But I’m going to hold off on that and just focus on my EP. And the Young Money album, Rise of an Empire. The whole team is on there. Plus Wayne is working on Carter 5. I’m working on my album. Just the family, you know what I mean. And mainly that’s my focus. Just to try and soak up game and keep working. Can’t wait for all of those projects, especially your debut album. Now let’s get into some fun questions. (Laughs!) Ok, yeah. Let’s go. What are the three most important qualities in a lady? Hmmmm (weighs the question)… Her personality first of all. I can’t be around nobody that’s stiff or too into just they self. Or someone with no sense of humor, not cool to be around. I like a woman that’s down to earth. And, you know, any dude or anybody in their right mind would be lying if they didn’t say attractive. Everybody has their own preferences with that. So attractive also. So those things. And as long as she has something going for herself. Not just sitting around expecting something. What’s in the Cory Gunz go-bag? What are the must haves you simply cannot leave the house without? (Laughs!) I don’t know, man…. My phone is my lifeline. I can’t breathe without my phone. I write my rhymes and everything in there. My headphones also… Everything else is either immoral, too expensive, or illegal (Laughs!). Depends on where I’m at, man. In New York the torch right now for fast food is Burger King. It tastes fresh off the grill. Chick-fil-A too. They don’t have those up here though. That’s one of my like regular spots too. They need to get those up here. Name some of your early musical influences and also your top 5 MC’s. Me, me, me, me and me (Laughs!). Nah, but I feel I’m up there though. I grew up listening to Jay Z, Nas, Eminem, Biggie, ‘Tune. That’s Wayne, of course. Luda, Bone Thugs–N-Harmony, Twista, it’s so many I can name. But KRS One. My EP Kriminal Minded is based off one of his early projects. People are going to learn that though after it comes out. Pun, The Lox. And not just rap neither. My pops put me on to Prince early. So Prince too. Michael Jackson. My grandmother put me on to gospel music, The Temptations, that era. Do you like to travel? Where are your favorite places in the world, that you haven’t been to yet, but plan on going? Yeah, I like to travel. See more of the world. I want to go to Egypt. And I want to go to Venice. Venice, Italy. Water in the streets. Leave your hotel and get in a boat, sail through the city. I want to visit other parts of Africa. I’ve been to Paris. I’d visit there again. I want to go to Japan. Become a Ninja eventually. Attend a Samurai school in Japan (Laughs!). I’m going to take this ninja thing seriously. As seriously as I do the music. Need some new music from the GUNNA asap !! !